One of the strangest musical instruments in the Bible is arguably the shofar – the ram’s horn. It originates on a living creature, is cut off, and is returned to a living creature to be utilized in a totally new and important way. "Blessed are You, YHWH our Elohim, King of the world, who has sanctified us by His commandments, and has commanded us to hear the sound of the shofar." It is just a tradition to recite the prayer, but a detail in the prayer holds a hint to a unique insight and application for us. The word "sound" in the Hebrew blessing actually conveys much more than a generic "sound." Rather, the term is QOL, which literally means in the Hebrew tongue the concept of a "voice." A volcano erupting can make a sound, a lightning strike can make a sound, but they are not living beings, and so, they do not have a "voice." However, the ram's horn was once alive, and although is a dead object once it is removed from the animal, it is said to have a "voice." How can that be? "Blessed are You, YHWH our Elohim, King of the world, who has sanctified us by His commandments, and has commanded us to hear the voice of the shofar." Now, a shofar cannot really make a sound. It has no voice. It is not alive. It is just a vessel. A shofar requires someone to put into it the breath that creates the "voice." By breathing into the shofar, the user gives the shofar a voice. This is important, because in Hebrew, the word for "breath" is RUAKH, which is also the same word for "spirit." Whenever you say "breath," in Hebrew, you've also just said the word for "spirit" - RUAKH. In fact, the Holy Spirit in Hebrew is called simply RUAKH HAQODESH - the Spirit / Breath of Set-Apartness. "Speak to the sons of Yisra'El, to say, 'In the seventh month, on the first of the month, there shall be for you a rest, a memorial of sounding, a holy gathering.' "
13 No hand shall touch it, for he shall be certainly stoned, or certainly shot through, whether beast, whether man – he shall not live. In the protraction of the ram’s horn they shall ascend upon the mountain . 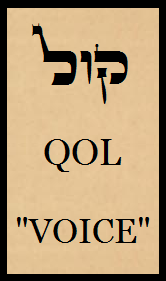 . .
Again, the word used in the text for "sound" is literally QOL - "voice," in Hebrew. The people had to wait for the voice of the shofar to be heard. It finally burst forth over the mountain, and the incredible Presence of the Most High came down in a way never experienced before by man. But wait -- who blew the shofar? No human man or woman had that authority or was given that directive. Rather, everyone was waiting to hear it. No man took it upon himself. No human blew the first shofar ever blown in Scripture. It was the Spirit who blew the shofar at Mount Sinai! The Spirit gave voice to the shofar, which gave men the ability to approach the mountain without fear of death! The Spirit called men to repent (to return) to the Most High. Now we can understand well the words of the verses cited above about commanding us to have a yearly memorial of blowing! It is the opportunity to recall the initial voice of the Spirit through the shofar that allowed Israel to draw near. When you blow the shofar and give the object a voice, remember that it is truly a spiritual event, for it was the Spirit who first blew it over His people at Sinai with the voice of acceptance! It is the call to return, to hear that we are accepted into His Presence once more!